WordPress themes play a major factor in your website. In this post, we will list you 30 Best Free Responsive WordPress themes. Wondering and wasting your precious time searching for the best responsive WordPress themes. If so, this article will be really helpful for you. 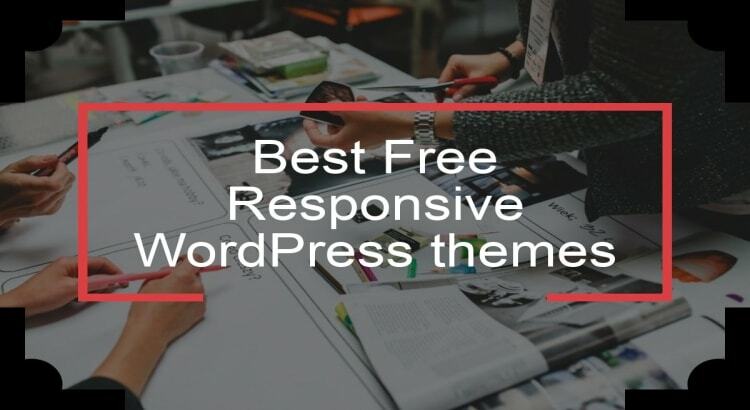 In this post, we have a collection for 30 best free responsive WordPress themes that you can pick and make use of it. Here in this list, you will find creative, well designed, and responsive themes that give special look to your website. There are numerous WordPress themes available on the internet. It is obviously tiring and time-consuming process to go on a search for these themes from different websites, check the specifications and choose the one that suits your website needs. In order to save your time and effort, we will help you to choose the best free responsive WordPress theme for your website. With the customization opportunities the themes offer, you can use these themes for any purpose. These themes come along with the premium version, where you can get additional features than free. Almost all the themes will allow you to make changes without even touching a single line of code. 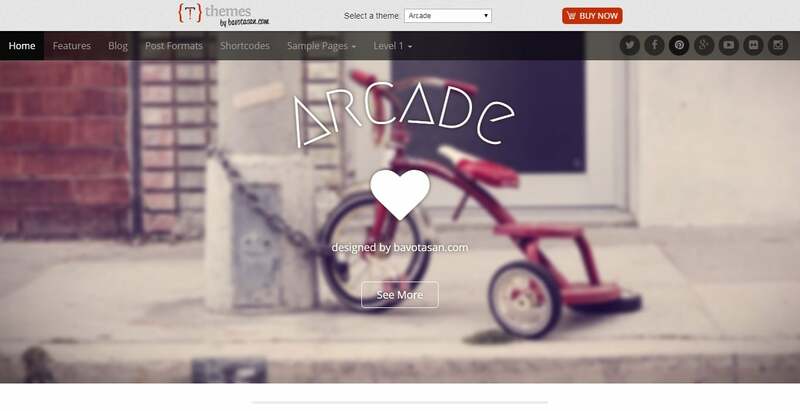 With these amazing themes, you can start creating your website. Flash is one of the most popular good looking multipurpose themes. This theme is best for modern, and professional websites. This theme has features such as built-in drag and drops page builder, pre-built demos, multiple header styles, multiple blog layouts etc. Flash theme integrates with the flash toolkit plugins and SiteOrigins page builder plugins. This makes the theme user-friendly and easy to use. Other features of this theme include 6+ widget areas, 11+ custom widgets, multiple color options, responsive design, WooCommerce support, boxed and wide layout, social buttons and product filters. This theme is SEO friendly and gives a better performance and speed for your website. With the premium support, you will have additional features. Hueman is one of the free responsive WordPress magazine themes. It has a unique customization technology allowing you to customize any page of your websites independently from the others. It is rare to get professionally designed, user-friendly, and highly flexible for free. If you wish to change the design of a particular page, just navigate to the page on your website, and then click the customize link on the top of the admin bar. This will open live customizer for you to design. It has high-resolution displays and smart adaptation to small screen devices. Hueman has extensive styling options, integrated share counts, flexible layout options, post formats, boxed layouts etc. Its vast styling options and adjustable layout settings allow users to incorporate a personal touch to their website. The Hueman theme gives you nice tools for uploading logos, and threaded comments help you keep the conversation going with the customers. SEO, WPML, contact form 7, and WooCommerce. It is natively responsive and cross-compatible with devices all over the world. GreatMag is an attractive news/magazine responsive WordPress theme. It is visually focused theme with featured images scattered throughout the homepage. It has translation ready elements which allow you to switch between languages. GreatMag comes with a bundle of features such as WooCommerce ready, localization ready, theme options, contacts page templates, responsive design, featured post sliders etc. This theme is packed with custom created widgets to customize your sidebar or widget areas. It has an easy to use administration panel, and easily upload your logo. There is the latest news ticker resides above the header, that gives a chance for you to prompt the followers when any breaking news arrives. It costs much when you go for the premium version. Parallax One is the most simple and elegant theme. Its multipurpose design professionally made to fit it to any kind of business. This theme comes with a clean, awesome and beautiful parallax header. Parallax One does not have any portfolio section as a replacement, which is great for consulting and digital service firms. This can work with both multi-page and one-page theme. This theme has a localization built in. You can get unlimited color options for branding and matching website colors for your logo. Parallax One will include the basics on your homepage, and get visitors to convert with call-to-action buttons. This theme comes with numerous features such as lots of social icons, custom logos, multiple color schemes, responsive, WooCommerce integration, widget ready, smooth scrolling, custom post types, pricing tables etc. 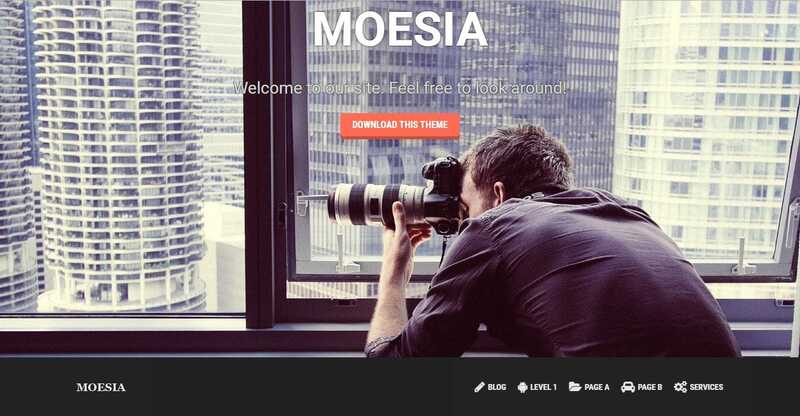 Moesia is a flexible and most powerful WordPress theme. This beautiful theme can be used for all size of business. It comes with 7 predefined blocks, you can locate your homepage to build the website as you desire. It provides Google fonts for you to choose typography settings. With its responsive layout, it allows people to view the site on mobile devices like phones and tablets. It has featuring cool animations and effects, a parallax header, Google fonts etc. It also has translation-ready features and custom widgets to build your website and reach out to new customers. 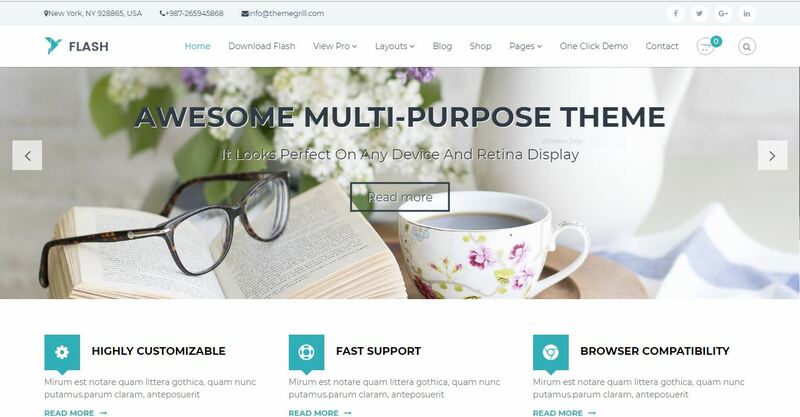 Moesia is 100% responsive theme. Its other features include powerful theme customizer, 5 custom widgets, 2 types of layouts for the blog page, parallax backgrounds, includes social icons etc. 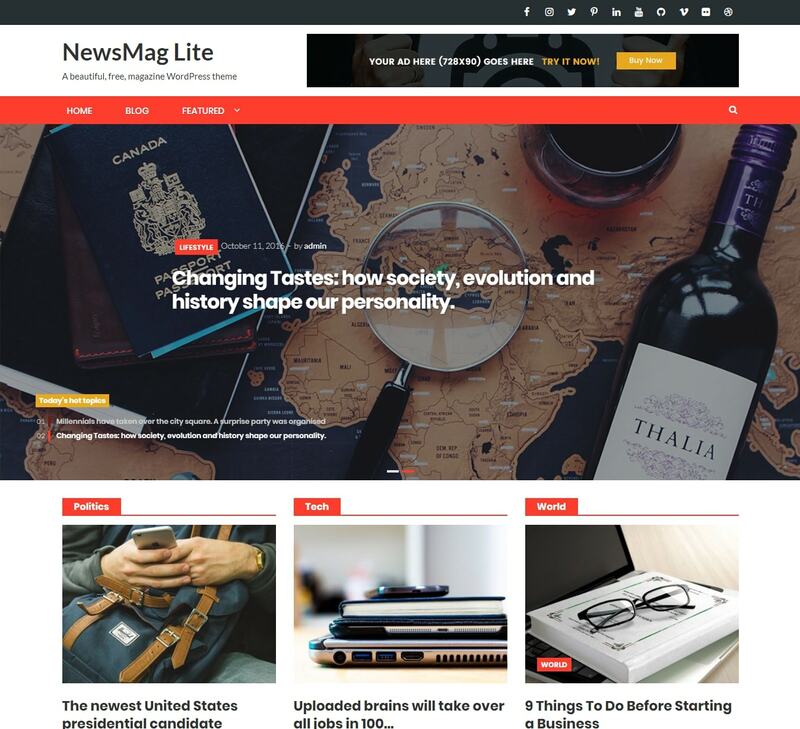 Newsmag Lite is a user-friendly, reliable, modern, fast loading, highly responsive free WordPress online magazine theme. It is a multipurpose website theme. This theme is packed with multiple niche market demo templates that you can easily import with a single click. It offers a collection of powerhouse tools and premium quality features built right into this potent free theme. It is a versatile online magazine website theme. Newsmag Lite is capable of servicing the needs of webmasters across a broad range of industries and fields of interest, regardless of the scale of the audience. It includes other features such as translation ready, custom logo upload, widgetized footer, parallax featured images, ad-friendly etc. Astrid is one of the beautiful and responsive WordPress themes. It comes with a lesser time installation, 5 minutes set up etc. 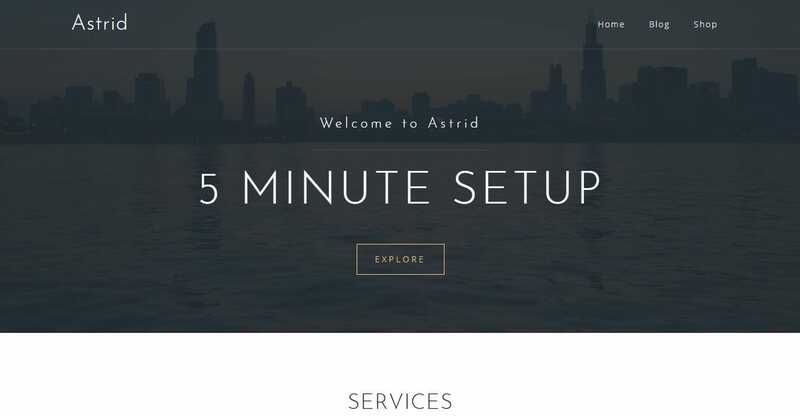 With Astrid, one can use a custom widget and template to create a customized business layout. It has options for fonts, header area, colors, blog related things. In addition, it has a full-width header image, that looks something that you find in a paid theme. This theme is ready for translation into multiple languages. This time comes with custom widgets which you can use to add multiple options in the sidebar areas. It has an active translation feature, ensuring that the content is available globally. Astrid comes with a well-secured template. This theme can be used to run a fully functional blog as it includes features like threaded comments, features image, sticky post, right sidebar etc. By choosing this theme you will enjoy the benefits of updates based on user feedback and of course bug fixes. 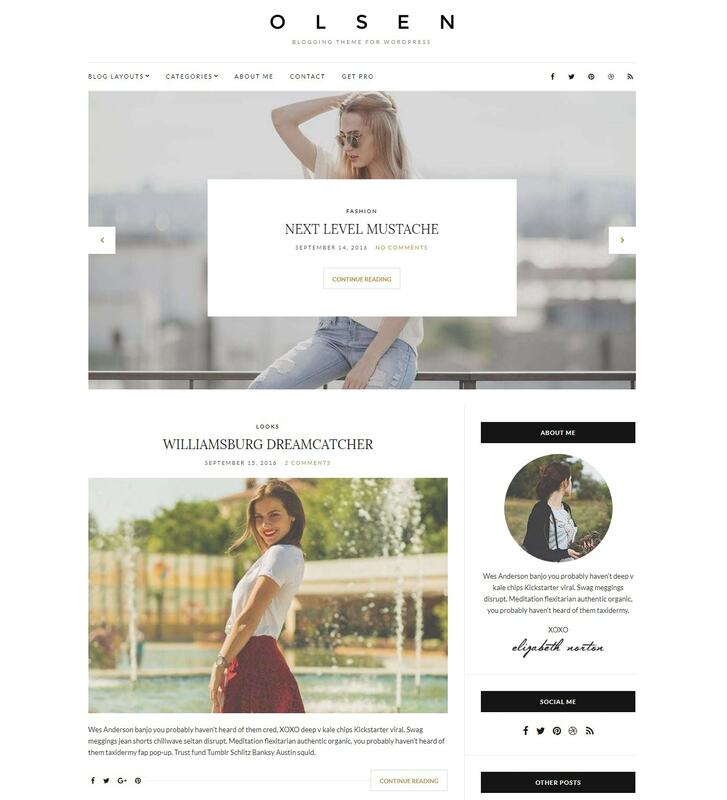 Anariel Lite is a modern and classy WordPress fashion blog. It is licensed under 100% GPL. This seems to be one of the best themes for fashion related blogs. It is retina ready and fully responsive design. Anariel Lite works amazing on all the devices, tablets, mobiles, and desktop. It comes with 6 pre-defined demos that you can install with just a few clicks. This theme comes with minimalist design, elegant typography, and great sidebar elements. It includes features such as essential grid plugin, lightning-fast loading speed, revolution slider, a full-width page with slideshow and sidebar page with slideshow, CSS3 features and animations, well-written and detailed documents etc. Anariel Lite supports nearly 700 Google fonts, along with numerous social integrations and shortcodes. This theme supports both audio and video posts. Sydney is a modern powerful WordPress business theme. This theme is mainly designed for companies and freelancers who wish to present their business online. It is a beautifully designed theme with wonderful features. This theme has plenty of customization options such as Google fonts, unlimited color options, sticky navigation, logo uploads and much more. Sydney theme can be used on mobile devices and it comes with almost 600 Google fonts. It has a bundle of features and functionalities that are all required for a perfect website. Its main features are parallax background, slider or static image header, social link integration, live customizer, front page blocks etc. This theme is complete translation ready. ultimate level of design control. Social integration is made easy, helping you to create buzz. It includes other features such as PayPal support, custom login pages, WooCommerce, multi-language support, monetize your site, search filtering, advanced search options, Google maps integration etc. This plugin is SEO friendly and has an ultra responsive design. 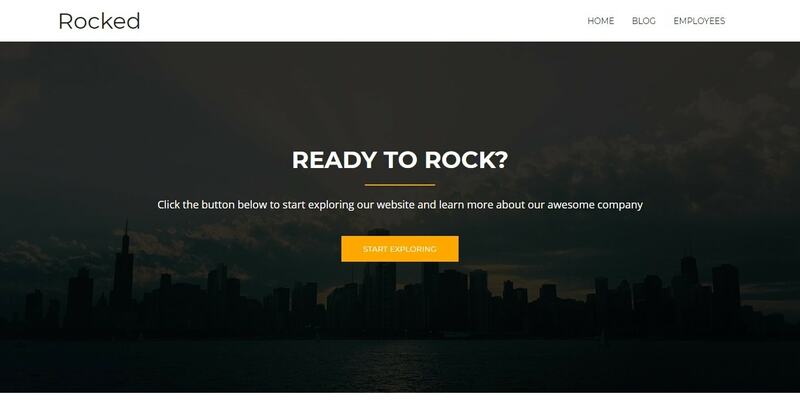 Rocked is a modern, clean, and beautiful business WordPress theme. This theme is provided by aThemes. This theme has a lot of interactive elements such as animations, catchy sliders, parallax scrolling, counting stats, progress bars etc. The rocked theme is combined with white, black and gold color which gives you an elegant design. This theme helps you to build a great business website for your organization. 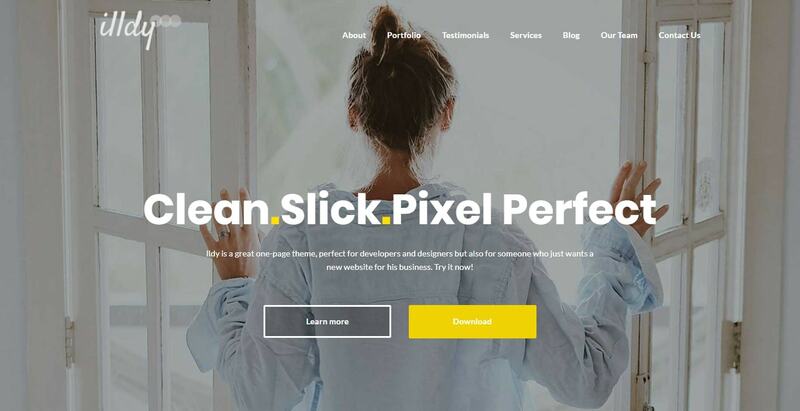 The sticky header feature in this theme lets you display your business brand all the time so that it makes easy for your visitors to explore your website. With this theme, you can also add logo image for each feature, making the list of features more interesting to read and explore. Additional features include a simple navigation menu, client list section, blog post-integration, clean and professional branding, company features section, portfolio showcase section and much more. This modern and clean theme makes sure to keep your users hooked on your website. Arcade is one of the free construction business WordPress themes. You can use arcade even for the architecture and other building companies and for projects websites. Having tons of features and layout possibilities, arcade seems to be an eye-catching theme. The theme’s features include full-screen header image, widgetized homepage area, large call-to-action, and a block of posts. This theme has 8 supported post formats. 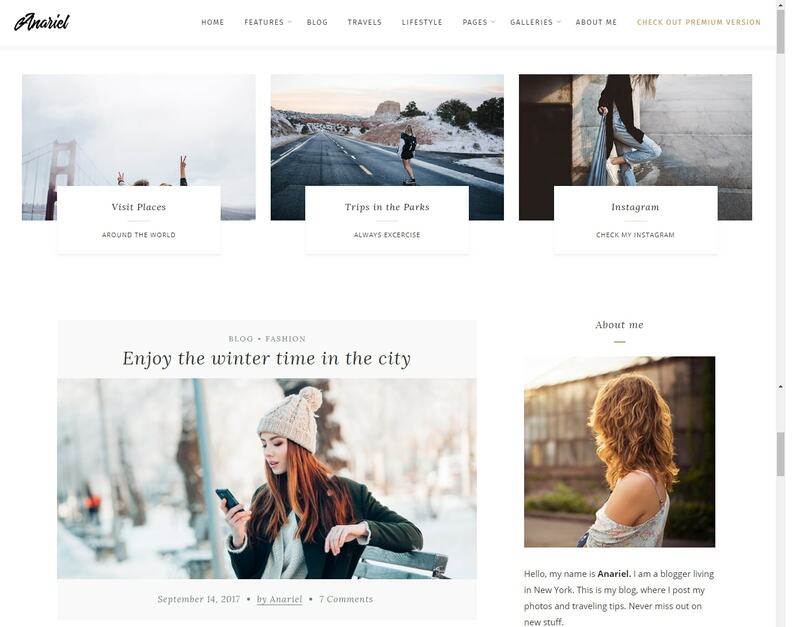 This theme is not only constructive to make beautiful blogs, it is highly responsive, and works well even on tablets, mobiles and other devices. Arcade can access a wide range of Google fonts. The theme customization is easy to use, allowing for the customization of the header, site width, and page layout. This theme integrates well with BuddyPress and WooCommerce plugins. Onetone is one page, parallax scrolling responsive business WordPress theme which is based on HTML5/CSS3. This theme displays the required information on a single page with clear order according to the user’s preferences. This theme has an extensive admin panel where unlimited sections can be easily added. It has multiple options such as changing the background, video background, uploading logo, font icons, favicon, adding custom CSS, and so on. The design of this theme is flexible, lightweight and beautiful. With this plugin, you can alter and personalize every element. If you want to create more individual sections, you are free to do so. Simply access the admin panel and add as many as you wish. This theme is compatible with WooCommerce, contact form 7, Elementor page builder and Polylang. 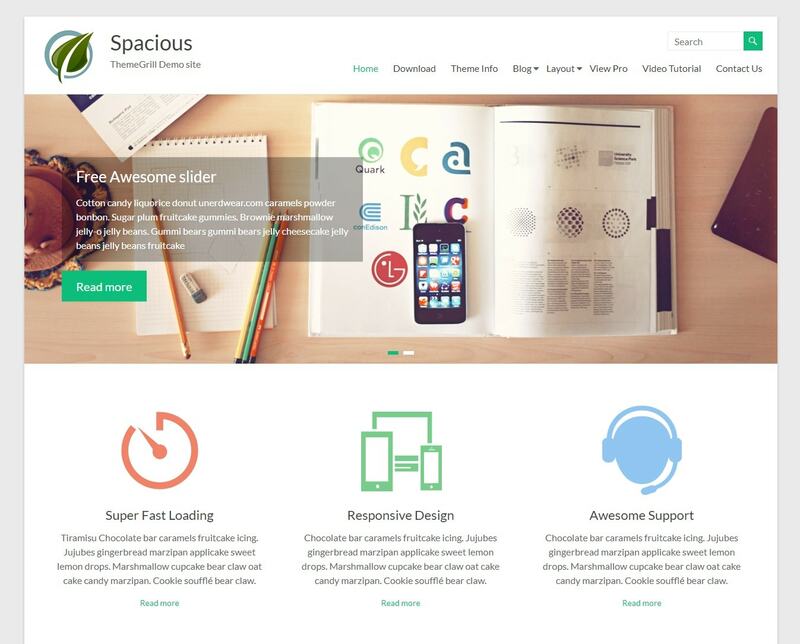 Spacious is the most popular, flexible and highly rated WordPress theme. This theme is a multipurpose free business WordPress theme. It has over 70,000 active installs. This theme is composed with full of features to customize the look of your WordPress website. It includes features of different blog display types, multiple page layouts and page templates, business-focused custom template, boxed and wide layout, and much more. It is responsive, SEO optimized theme. This theme looks classy and stylish, highly personalized, sophisticated and trendy, dynamic and professional WordPress theme for corporate websites. 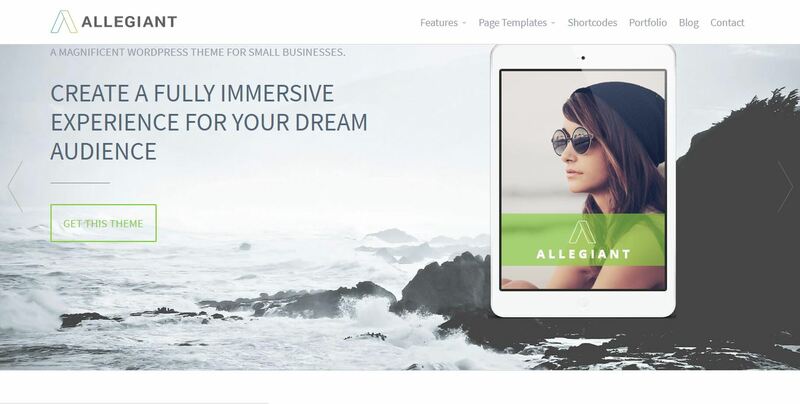 This theme has 4-page layouts, 6-page templates, 13 widgets area, 5 custom widgets focusing on the business template. It has an awesome slider, primary color option to match your logo and website. 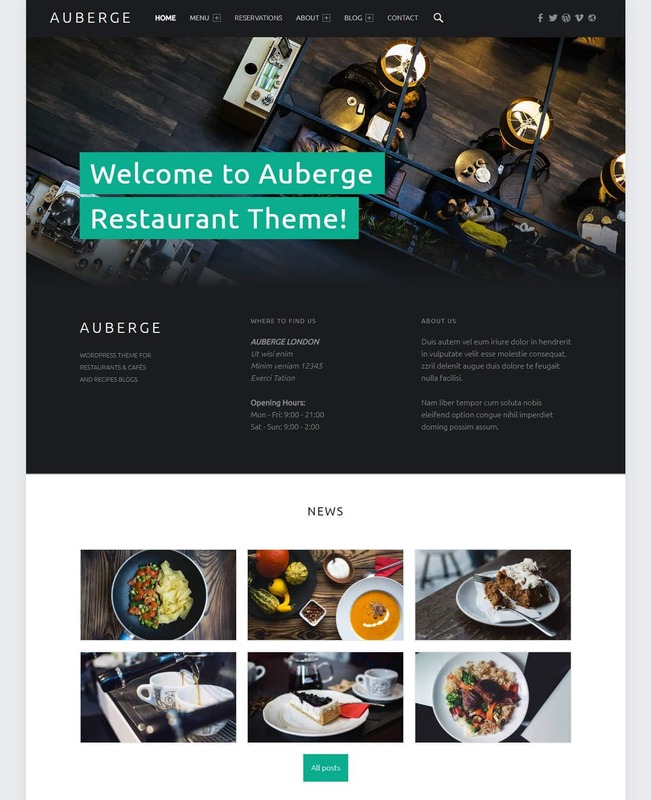 Auberge is a free, modern restaurant and cafe WordPress theme. The black and white combination in this theme gives you an elegant look. This theme is widgetized, social, responsive and has tag buttons. This theme supports the Jetpack plugin to create the food menus. Auberge is compatible with all most all the browsers. This theme supports Beaver Builder page builder plugin, Schema.org markup, translation ready code, theme hook, action hooks, customizable colors, header slideshow etc. This theme includes features such as infinite scroll, sharing buttons, tiled galleries, food menu posts, site icon, favicon, image logo, image lightbox zooming effect and much more. Vega is a free, clean multipurpose WordPress theme that can be used for small business or for personal blog websites. With the help of this theme, you can even set up a single page website. This theme gives a fast and easy experience to the visitors visiting your website. This theme allows you to create a multi-language website and it is WooCommerce ready. 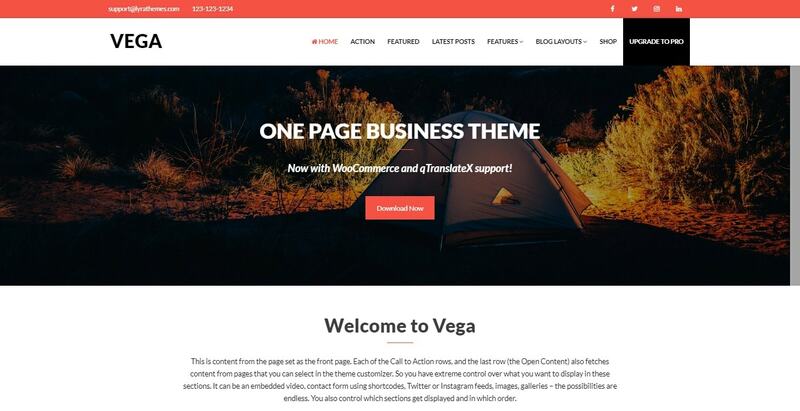 Vega is 100% responsive theme. It has key features such as built-in touch supported slider, built-in ken burn supported slider, built-in demo importer, built-in lightbox etc. It has automatic updates for a lifetime. This theme is compatible with all browser and plugins and it has an ultra responsive layout structure. It has tons of widgets & Widgetized area and has unlimited color options and color variations. It has predefined sidebar locations and easy to apply them per page basis. With its extended functionality and features, it attracts the users. 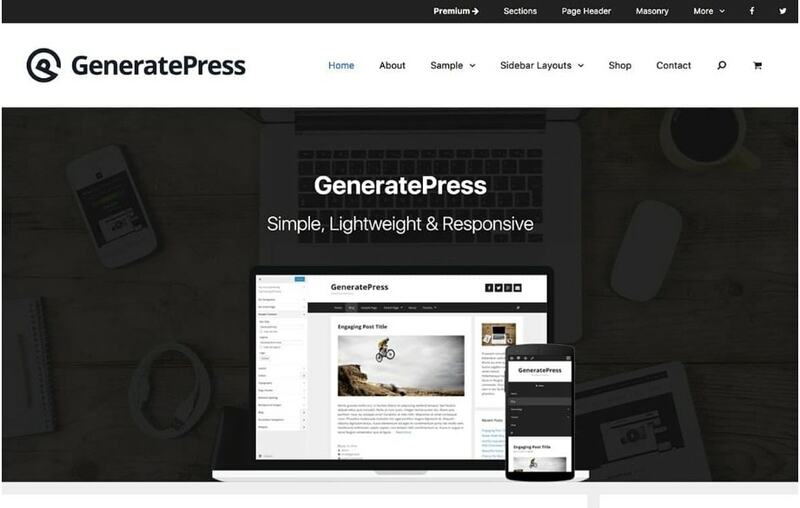 GeneratePress is a lightweight freemium WordPress theme developed by Tom Usborne. This theme works with all most all page builders and has the most extensive documentation of any theme. This theme is coded well and the theme size is very light. GeneratePress theme comes with 14 modules that enable you to leverage the functionality of the theme. This theme has inbuilt options for you to add hooks and filters without altering the theme files that gets reset after the theme is updated. This theme comes with translation ready, so you can easily translate it into multiple languages. It comes with full support for WordPress theme customizer, so you can easily make live changes to the design of your website without writing a single line of code. It has advanced customization that lets you disable specific elements on certain pages and posts, build unique layouts using sections inside your pages, and hooks allowing you to add in your own custom content throughout various areas in them. 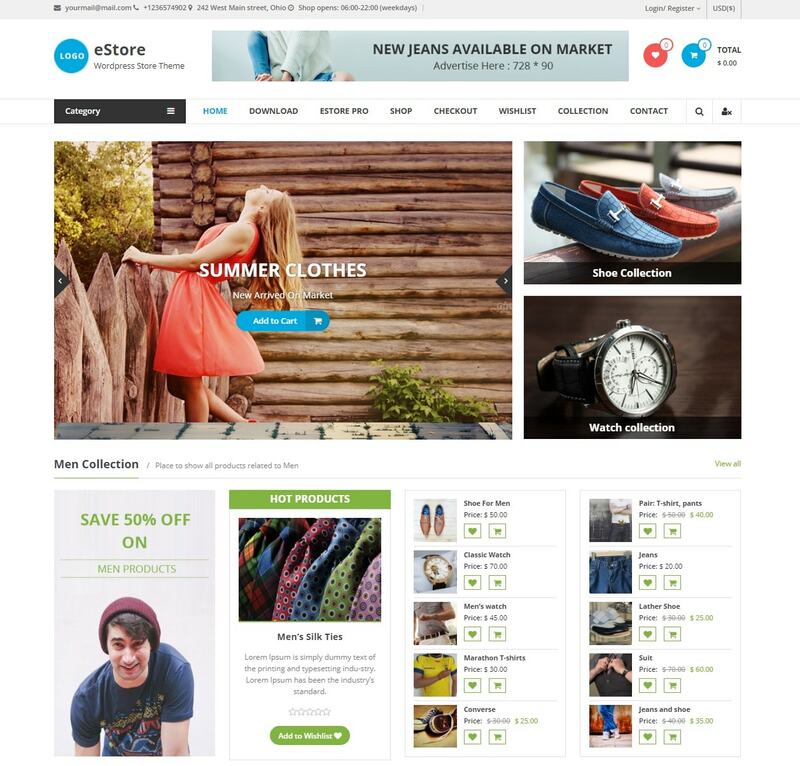 eStore is a beautiful, clean, best responsive WooCommerce WordPress theme. It is an elegant solution for those who are looking to sell their products online. As an online seller, attracting customers and selling products will be easier with this theme. The configuration process is very easy, and this theme offers integration options with some of the most popular e-commerce plugins, including PayPal, shopping cart, and eShop. It has features such as drop-down navigation, carousel slider for the deals of the day and much more. 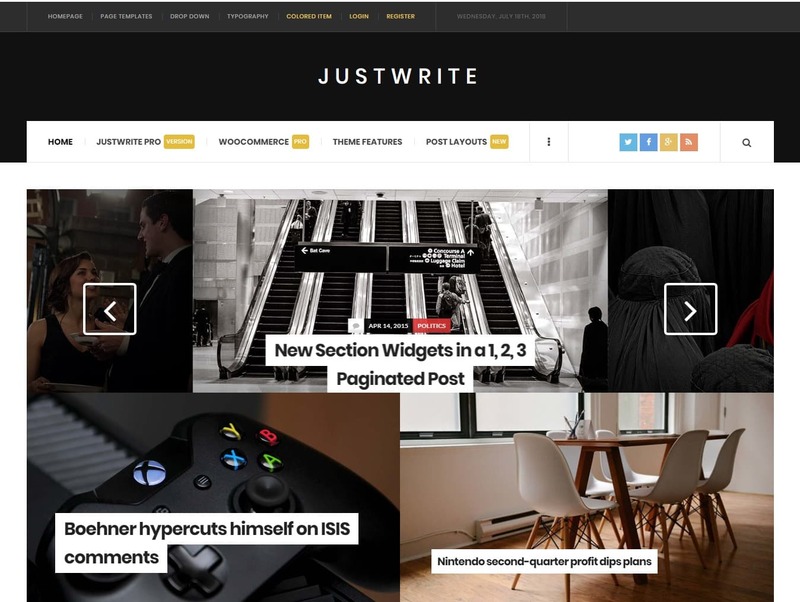 JustWrite is a new magazine theme for WordPress website. This theme display categories, widgets, and posts. This theme is basically a magazine and blogging theme for the journalists and writers who are expert in writing content for the people out there. JustWrite theme achieves a balance between the space and content. This plugin is built with the concern for the WordPress standards and quality. If you wish to start an online magazine, then this template will be a perfect choice. JustWrite is very responsive and works with all the devices including handheld devices. 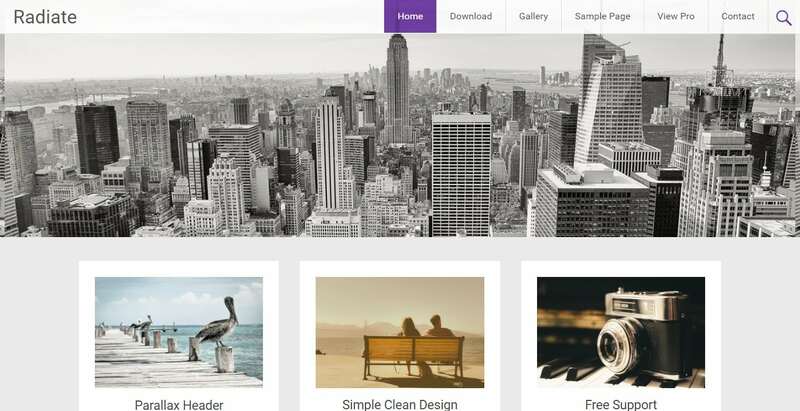 Illdy is a beautiful, well designed, clean and chic WordPress theme. This theme is a great option for the landing page, personal blog or websites, portfolio etc. It is mobile friendly, fully responsive theme. Customization is very easy and it is less time-consuming. It is flexible enough to handle business pages, creative pages, and landing pages. Illdy comes with features such as WordPress live customizer, retina ready icon, shortcodes, multiple and diverse layouts, template pages etc. It is fully prepared for modern websites of any kind. Illdy naturally fits on all the devices, browsers, platforms and screen sizes. 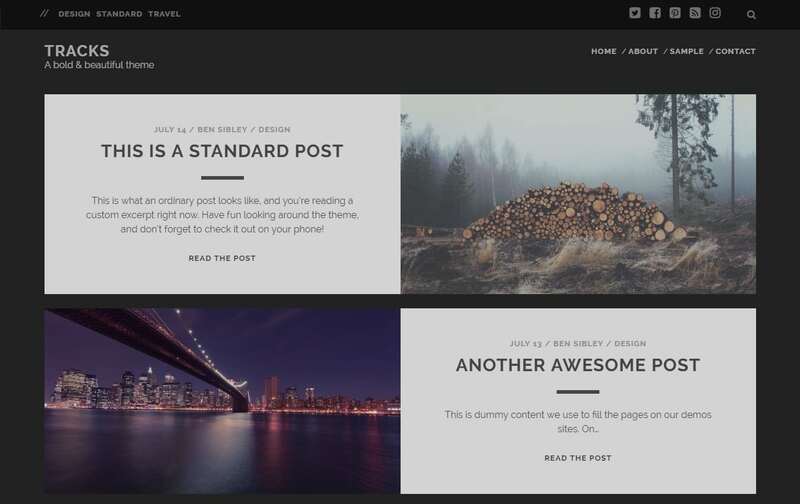 Radiate is a free personal blog WordPress theme. It is very responsive and easy to customize. This theme is light retina, that your content will look crisp and clean on any devices. You don’t have to touch even a single line of coding while using this theme as well as maintaining this theme. This theme is translation ready for a number of languages such as Russian, German, Spanish, Swedish, French, Portuguese, Norwegian, English. In this theme, you can quickly and easily edit the layout with options to set up the header, footer, or add a slider. This theme supports parallax header image that integrates with the primary color and custom CSS. Radiate follows the best SEO practices. This theme supports RTL. Radiate is compatible with all major browsers. 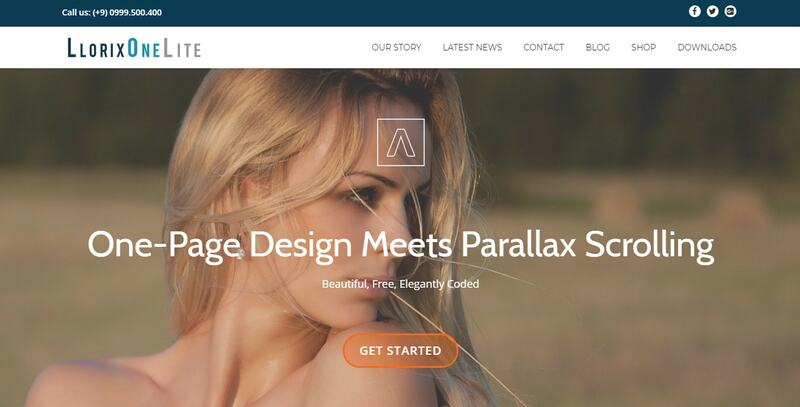 Llorix One Lite is a free WordPress theme that is mainly suited for digital agencies. 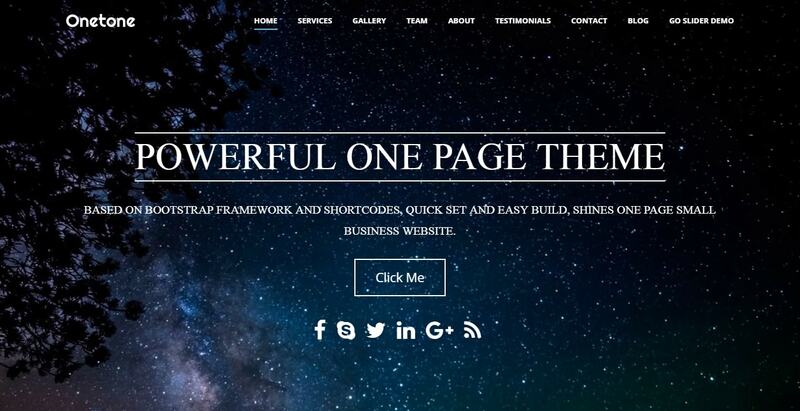 This theme features to clean bootstrap design with the elegant parallax effect. This theme includes a fixed header navigation that has smooth scrolls to sections, testimonials, team, company story, and integrated blog feed. Llorix One Lite theme has numerous color fonts and buttons that make your website look fresh and clean. This theme can be used for agencies, startups, small business, photography portfolio, corporate and any other purpose as its design has a multipurpose look. It has features of the full-screen image and the layout itself is mobile friendly and responsive. The theme provides eCommerce ready, Photo gallery grid, Metaslider, Jetpack compatible, Contact form 7, etc. It is completely SEO friendly, translation ready, cross compatible, simple to use. It offers premium features out of the box so that you can create a functional website very quickly. Olsen Light is a simple, beautiful, classy and very clean WordPress theme. This theme is ideally used for lifestyle, fashion, travel, and for any other personal blogs. This theme has nice widgets, author boxes, and Instagram carousel. It also has nice icons, typography, and buttons. Olsen Light theme does a wonderful job of presenting materials in a right way. It has social media buttons, that helps you to connect people through Facebook and Twitter. This is a full-width template and the responsive layout is sure to improve the number of people who come to your website. This theme has the translation ready, threaded comments, color tools etc. Tracks is a beautiful, unique WordPress theme that suits for blog or magazine websites. 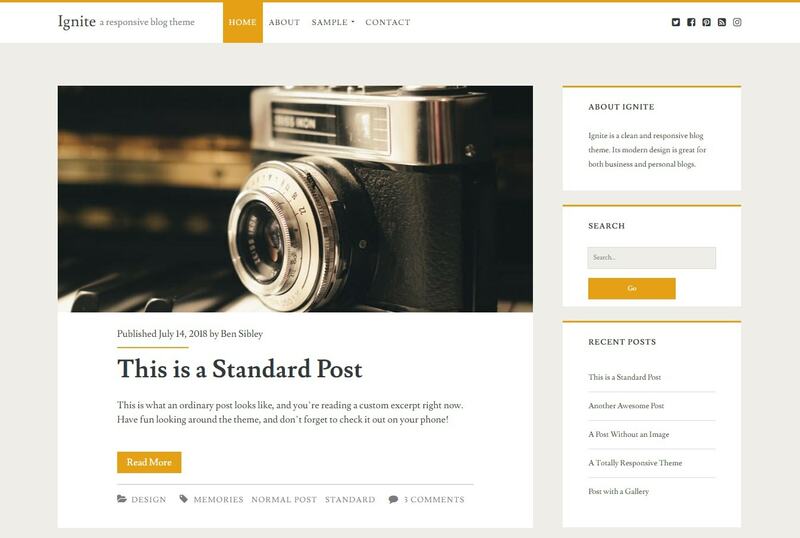 For blog lovers, this theme is a perfect choice for its beautiful big features image in the homepage loop. This theme incorporates social sharing buttons and a search function, both of which can be added to the header bar. With the CSS hero, you will be able to customize and add a touch of your personal choice with fonts and colors. You can also upload your image logo or you can create a new logo with tons of Google fonts. There are a cool author bio box and a well-designed comments section. This is a 100% responsive theme with no doubt. It uses “fitvids.js” to make sure that videos in your posts are also responsive to devices. This theme works fine on all the devices including desktops, laptops, tablets, and phones. It is SEO friendly as well as very flexible theme loved by everyone. 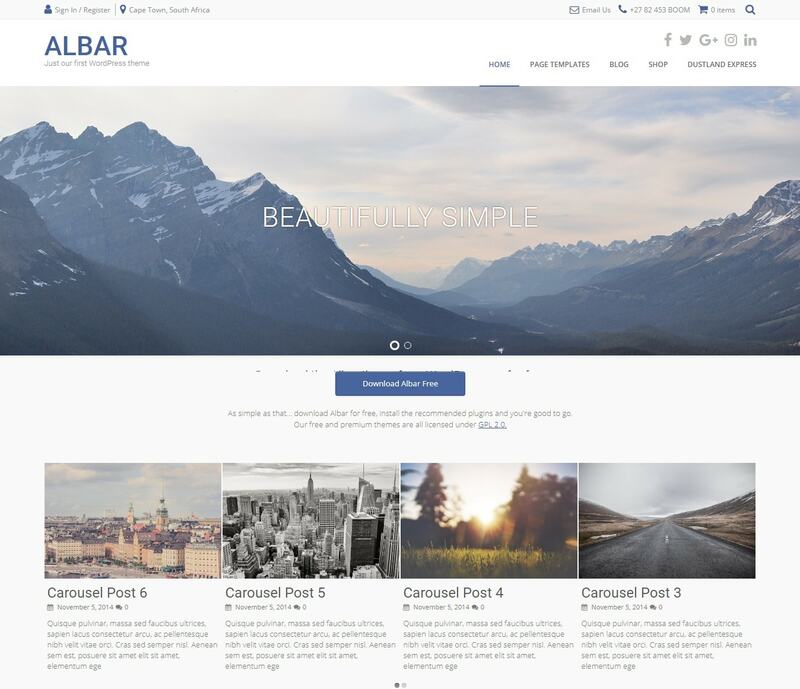 Albar is great looking, responsive and eCommerce WordPress theme. It is ideally used for business websites, portfolios, online store or to a simple blogging website. With its stylish slider and image carousel on the homepage, it looks awesome and grabs the viewers attention. This theme integrated with popular plugins such as WooCommerce, SiteOrgin’s page builder, contact form 7 and much more. This theme gives you the ability to choose between full width and boxed layouts. It can support lots of customization. Here you have unlimited color options and hundreds of Google fonts. It includes features such as repositioning the sidebar, minimal bloat etc. Ignite is one of the best solid free choice themes. It gives a nice looking social media buttons, accent colors ,and the layout. 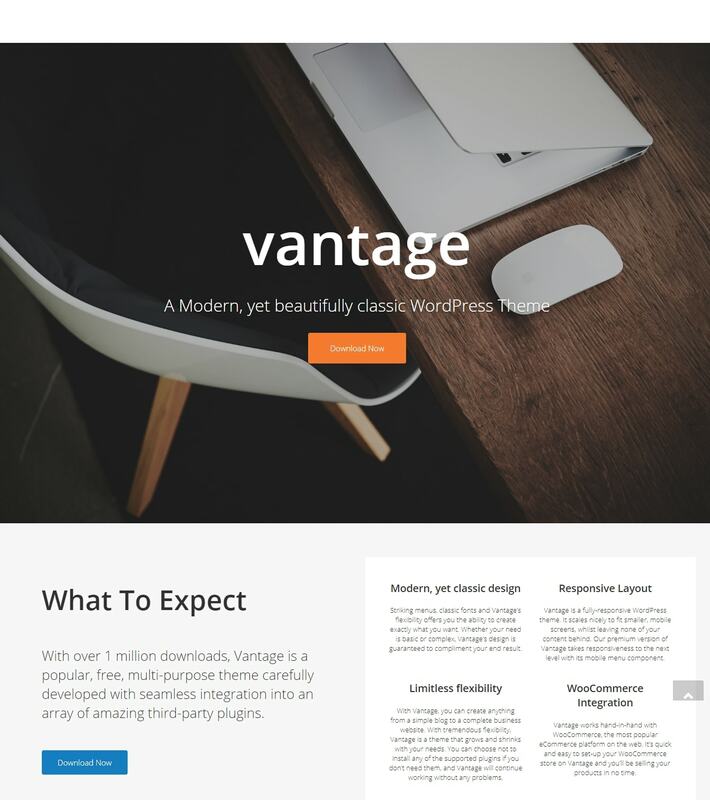 It is a clean and professional WordPress theme. Ignite includes few sidebars as well, and these sidebars have widgets for you to place on your website. Also includes modules for recent comments, recent posts and search bars. This theme is completely responsive and flexible viewing on mobile devices and the threaded comments are nice for chatting with the customers. This theme lets you choose any background color you want, move the sidebar either side of the screen and this free version theme supports five fonts. 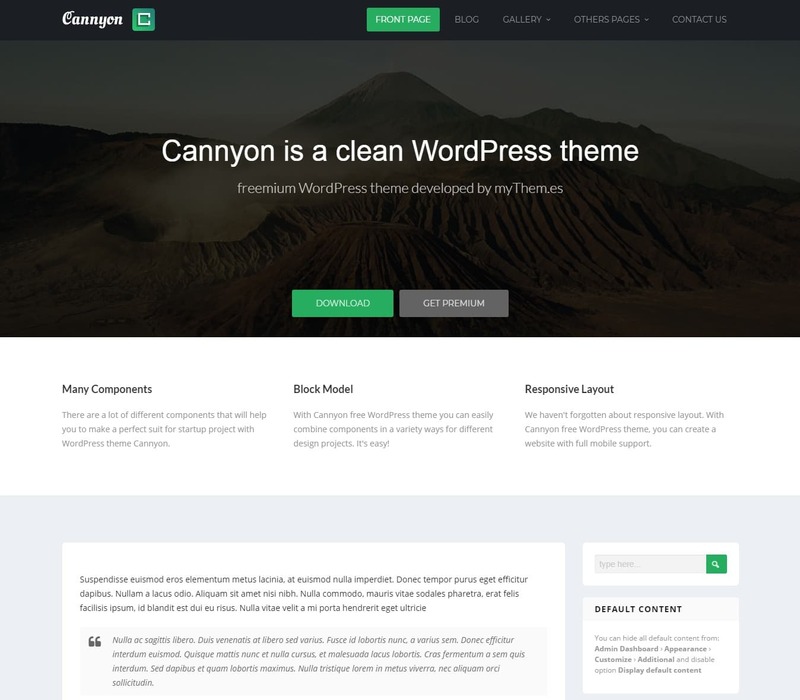 Cannyon is a modern, beautiful and elegant free WordPress theme. This theme is built with HTML5 and CSS3. Cannyon can be used for business, corporate, portfolio, products, creative, arts, design, construction, transport, manufacturing, ecology, cosmetics, beauty, hygiene, sports, culture, presentations, food business, restaurants, drink, bar, pub, club, radio, television, music, movies, live style, garden, cuisine, chemical, pharmaceutical, medicine, travel, sample blog, agriculture, science, politics and more others. This theme includes features such as social media buttons, parallax effect, colors of your own choice etc. This theme works well on all the devices. The responsive design is based on twitter bootstrap framework. Cannyon is developed by myThem.es. It includes features such as translation ready, responsive layout, custom header, custom background images and colors, custom logo and favicon etc. This theme supports plugins such as JetPack and contact form 7 plugin. It is very easy to customize and setup. 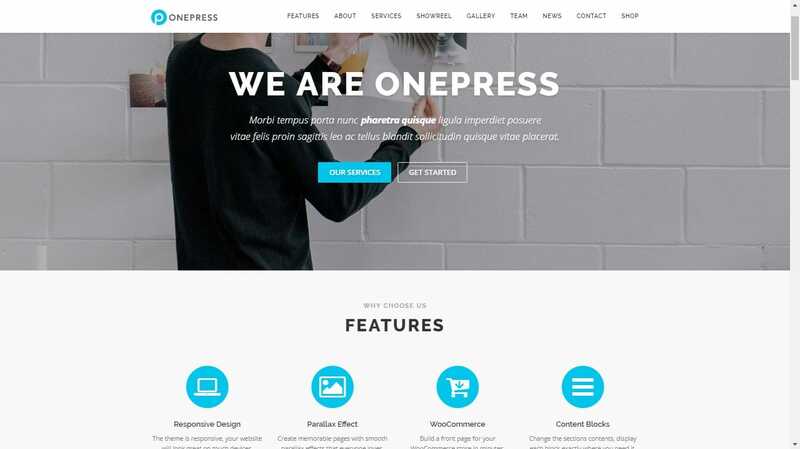 OnePress is an outstanding, creative WordPress theme. This theme is very responsive and user-friendly. OnePress is suited for portfolio, digital agency, freelancers, product showcase, business websites etc. This theme includes controls in the customizer for setting social profiles in the footer. It is an excellent example of how a single page WordPress theme can be easily configurable via WordPress native customizer. This theme includes a setting for pasting in a MailChimp action URL for a newsletter signup form. WooCommerce plugin integrates with the OnePress theme, it gives you a wise choice if you plan on selling physical or digital products from the comfort of your website. In the theme, the latest news modules are sure to keep your content updated on a regular basis. The contact form cuts out the need to go out and get a third party option. Ward is a lightweight and fully responsive WordPress theme. This theme is created by Bavotasan.com. With this theme, you can create and manage business websites very easily. This theme is compatible with bbPress and BuddyPress. Ward helps you change the theme appearance, manage theme settings. It supports Google fonts for managing typography. It includes features such as custom background, add own header image, site width, 8 supported post formats etc. This theme is built using the compass, SASS, and twitter bootstrap. The entire framework is easy to modify. This unique theme offers heaps of font options that improve website readability. When deciding a theme for your website, it is essential to check its major features such as responsiveness, user-friendly, beautiful design, and layout, SEO friendly, speed optimization, translation ready, custom CSS. WordPress themes are essential for any WordPress website. Themes help you to grow your business to next stage. 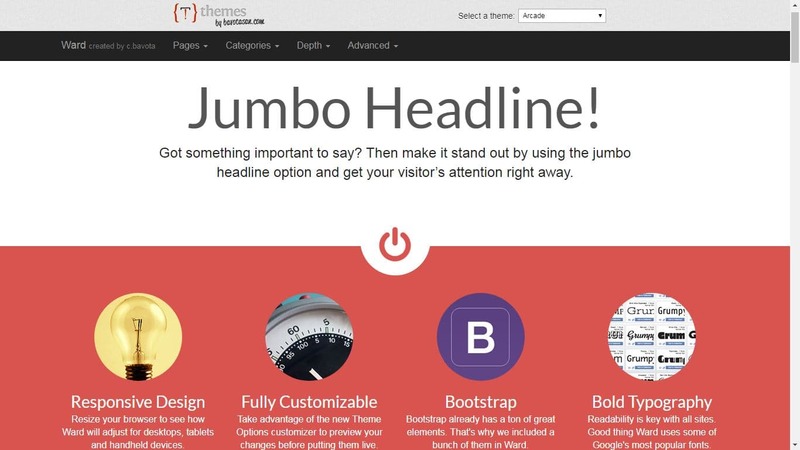 With the help of these themes, you can do miracles to your website. The above listed are the most important best free responsive WordPress themes. Hope you understood about these themes and its features. If you have any queries please feel free to comment us. You can subscribe us at Facebook and Twitter. How to get HTTPS for free with Let’s Encrypt?